The effectiveness of survivorship care plans has not been widely tested. We evaluated whether a one-time brief lifestyle consultation as part of a broader survivorship care plan was effective at changing diet and lifestyle patterns. A diverse sample of women with stage 0-III breast cancer were randomized to control or intervention groups within 6 weeks of completing adjuvant treatment. Both groups received the National Cancer Institute publication, “Facing Forward: Life after Cancer Treatment.” The intervention group also met with a nurse (1 h) and a nutritionist (1 h) to receive personalized lifestyle recommendations based upon national guidelines. Diet, lifestyle, and perceived health were assessed at baseline, 3 and 6 months. Linear regression analyses evaluated the effects of the intervention adjusted for covariates. A total of 126 women completed the study (60 control/66 intervention, 61 Hispanic/65 non-Hispanic). At 3 months, the intervention group reported greater knowledge of a healthy diet (P = 0.047), importance of physical activity (P = 0.03), and appropriate use of dietary supplements (P = 0.006) and reported lower frequency of alcohol drinking (P = 0.03) than controls. At 6 months, only greater knowledge of a healthy diet (P = 0.01) persisted. The intervention was more effective among non-Hispanics than Hispanics on improving attitude towards healthy eating (P = 0.03) and frequency of physical activity (P = 0.006). The intervention changed lifestyle behaviors and knowledge in the short-term, but the benefits did not persist. Culturally competent long-term behavioral interventions should be tested beyond the survivorship care plan to facilitate long-term behavior change among breast cancer survivors. This study was funded by Susan G. Komen for The Cure DISP0706868 (DLH), the Breast Cancer Research Foundation (DLH), and National Institutes of Health National Cancer Institute K23CA141052 (HG) and NCI R25T CA094061-12 (CSM). Office of Cancer Survivorship, National Cancer Institute. Statistics. National Cancer Institute, Bethesda, MD. 2014. Available from: http://cancercontrol.cancer.gov/ocs/statistics/statistics.html. Accessed Jan 10 2016. Surveillance, Epidemiology, and End Results Program. SEER cancer statistics factsheets: breast cancer. National Cancer Institute. Bethesda, MD,. National Cancer Institute, Bethesda, MD. http://seer.cancer.gov/statfacts/html/breast.html. Accessed Jan 10, 2016. American College of Surgeons. Accreditation Committee Clarifications for Standard 3.3 Survivorship Care Plan. American College of Surgeons, Chicago, Illinois. 2014. https://www.facs.org/publications/newsletters/coc-source/special-source/standard33. Accessed January 30 2016. Ganz PA, Casillas J, Hahn EE, editors. Ensuring quality care for cancer survivors: implementing the survivorship care plan. Semin Oncol Nurs; 2008;24(3):208–17. doi: 10.1016/j.soncn.2008.05.009. American Cancer Society. American Cancer Society: survivorship: during and after treatment. 2016. 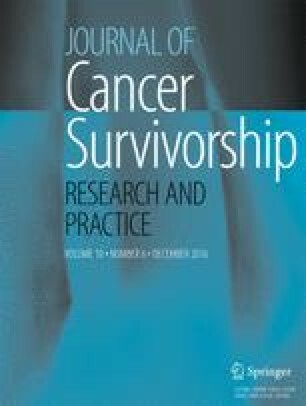 Available from: http://www.cancer.org/treatment/survivorshipduringandaftertreatment/index. Accessed Jan 10 2016. Canadian Partnership Against Cancer. Canadian Partnership Against Cancer: priorities: survivorship. Canadian Partnership Against Cancer, Toronto, Ontario. 2015. Available from: http://www.partnershipagainstcancer.ca/priorities/2007-2012-initiatives/strategic-initiatives-2/survivorship-2/. Accessed Jan 10 2016. National Cancer Institute. Facing forward: life after cancer treatment. National Institutes of Health, US Department of Health and Human Services, Bethesda, MD. 2014. http://www.cancer.gov/cancertopics/coping/life-after-treatment.pdf. Accessed Jan 10 2016.